I've played scorpion patients again. Dan! the Paul Newman of Chess. I love playing this on steam. I just can't get excited for platformers anymore. I hear good things. I like Skyrim of course so gotta check it out. Also that's a badass gift. I've played FO3 and I own New Vegas. The whole series is pretty damn good. Gosh, next you're going to tell me that Diablo II isn't still an awesome party game. I mean I have two mafiascum card decks so my opinion on awesome party games is kind of questionable. Ok so Carlsson moved a knight, just begging me to capture it with my queen. TG told me not to take it, because that move is too obvious, and so my opponent must be drawing me into a trap of some sort. I stared at it for a while and couldn't see the trap. I went ahead and took the knight. I guess I'll learn what the trap is, soon enough. I think a "You should have listened to your daughter" meme would be better here. 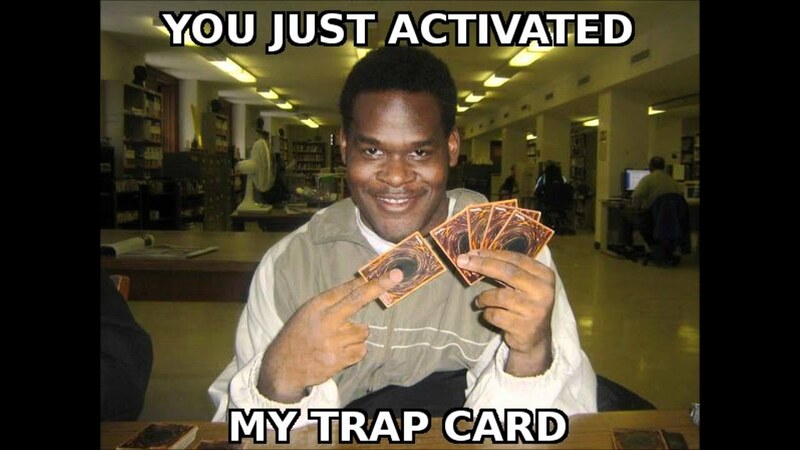 Real talk, this meme bothers me because you don't play trap cards from your hand you play them off the field. maybe that's the joke? I dunno. What game is that, anyway? TG, reading that post, says: "Are you going to post about how you have disobeyed my orders?" The mratriarchy runs strong in this one. Get her signed up in time for the next regime change. I have a good Magic story! As you probably know, Magic was released in the summer of 1993. A few months earlier, I happened to have lunch with the president of WotC. He still had a day job at the time, as the game-making gig wasn't doing much for him yet. In fact, WotC was under a lot of stress at the time, because they were being targeted by a predatory lawsuit by the idiots at Palladium Games. Anyway, Mr Adkison of WotC was looking for investments in his company. Major missed opportunity for me. I probably could have chipped in a thousand or two. But I didn't. Bummer.